Houzz.com, the leading platform for remodelling and design has recently awarded Designing Durham “Best of Houzz, 2015”. Designing Durham, a full service design firm was one of the design firms chosen by more than 25 million monthly unique users that comprise the Houzz community from more than 500,000 active home building, remodeling and design industry professionals. 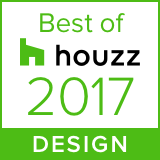 The Best of Houzz award is given in two categories – Design and Customer Satisfaction and Designing Durham has achieved both. Their featured designs were some of the most popular among more than 25 million monthly users on Houzz.com. The Customer satisfaction honour is determined by a variety of factors, including the quality of client reviews a professional received in 2014. Designing Durham has received a “Best of Houzz 2015” badge on their profile for both Design and Customer Satisfaction, helping Houzz users around the world discover and love a professional’s work, and to learn even more about that business’ popularity and satisfaction rating among their peers in the Houzz community.